Finally - a straight-up shot! 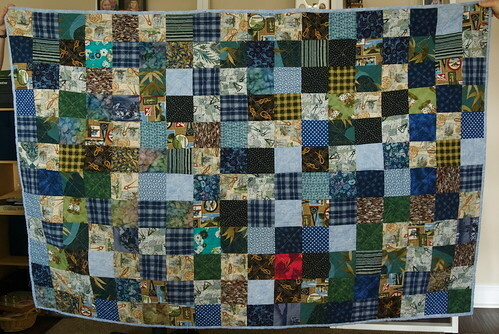 This is just a quick little entry for a quick little quilt. I'm going to make a few simple, easy lap-sized quilts for our living room, so we can discard a couple of old polyester blankets that have outlived their natural lifespan. I'm wanting to spend more time practicing my quilting, so having a few quilts that I'm keeping means I can practice my stitching on a non-critical project -- I have two coming up that are heavily dependent on the quality of the quilting stitches, and I needed some practice time.